On the evening of Thursday 8th February at 8.00pm, I received a text informing me that my Tedx talk had been released on youtube. I was surprised, shocked and nervous with anticipation all at the same time. As my Husband and I opened the link to watch my talk again I started to cry. Not because of sadness or regret- it was the realization that yet again I did something I never thought I could do. It was a long and challenging six-month journey to get to the moment of speaking before the live audience in November. 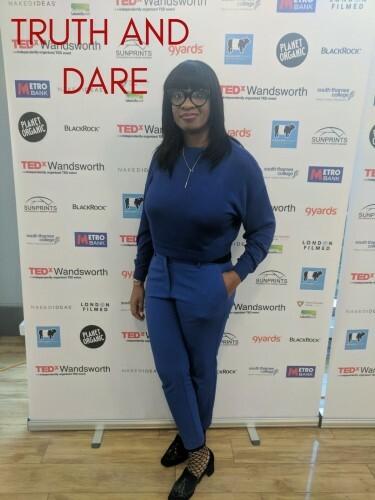 I went through the whole process from start to finish; I filled in the application form and gave a draft for my idea, went to the audition and worked tirelessly to sharpen and refine my presentation with the guidance of the TEDx team. I never gave up and the experience has further helped me to appreciate the importance of perseverance. I remember on the morning of the event, standing in the kitchen at 6.00am, tea in hand rehearsing my presentation as the cooker timer counted down. At that moment it suddenly dawns on me that I was about to make history. I am the first speaker under Tedx Wandsworth to give a talk under the same borough I was in care under, and the first to give a talk on sexual abuse from a survivor’s perspective. For years I dreamt of being able to share my idea via this platform and to be selected for a Tedx talk is one of the most wonderful things that has ever happened to me. I almost talked myself out of doing it because I am not the most eloquent of speaker- I trip over my words at times. But what I have in my favour is passion, vision and a sincere heart. I feel a real sense of personal victory and honor to be in a position to be able to share with the world an inside view of the challenges a survivor of sexual abuse has to face in order to speak out. As I walked onto the stage the very thought helped me to overcome my nerves and gave me the courage to be able to articulate an experience that many will never understand. The response to my talk has blown me away. I have received emails from places such as Salt Lake City, Ohio, Germany, France and the U.K, from survivors sharing their stories and thanking me for speaking out and giving them hope, also the many comments shared under the actual video have been most encouraging. The aim of my talk was to show people what causes survivors not to speak out, to encourage them to listen and to empower survivors to find their voice. I believe my talk has achieved what it set out to do and much more. I hope by daring to speak out in truth it will empower people to make a difference; listening can do more than you can ever imagine.